A colourful and revealing look at more than 500 years of commerce conducted at the renowned Frankfurt Book Fair, from its beginnings in the Middle Ages. Even then, in spite of internal strife and religious upheaval, books were becoming increasingly accessible to those who found their way to Frankfurt to buy, sell, and promote. The fact that King Henry VIII sent Sir Thomas Bodley as his personal emissary to purchase books for the new library at Oxford University is an indication of the Fair's growing importance outside Germany. Through the ensuing centuries, the fortunes of the Fair waxed and waned; however, the period following the Second World War brought with it a new spirit of renewal that has yet to lose momentum. In recent years, increasing number of international book fairs have taken the Frankfurt model, and each is finding its own way to further enrich the world of books everywhere. Here is a colourful and revealing look at more than 500 years of the commerce conducted at the celebrated Frankfurt Book Fair all the way from its humble beginnings in the Middle Ages. Through the ensuing centuries, the fortunes of the fair have waxed and waned. Following the Second World War, a spirit of renewal was engendered that has been maintained ever since. 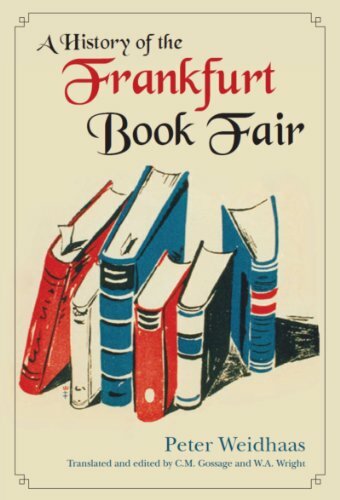 In recent years, increasing numbers of international book fairs have taken Frankfurt as their model and each is now finding its own way to further enrich the world of books everywhere. Peter Weidhaas offers a most entertaining and historical look at the Fair, showing the importance of books through the centuries, and their importance is still as strong today. He writes with insight ... about the bazaar and the bizarre that make up the world's largest, annual meeting of minds and money. This delightful tome is not only a comprehensive record of the postwar development of the world's largest and most organized book fairs, but also a summary of how today's book industry developed over the past 600 or so years. Fascinating, expertly written, and full of anecdotes and insights, A History of the Frankfurt Book Fair is strongly recommended as a core addition to personal, professional, academic, and community library collections, as well as the for non-specialist general reader seeking to learn more about the origin of the model that all modern book fairs follow.